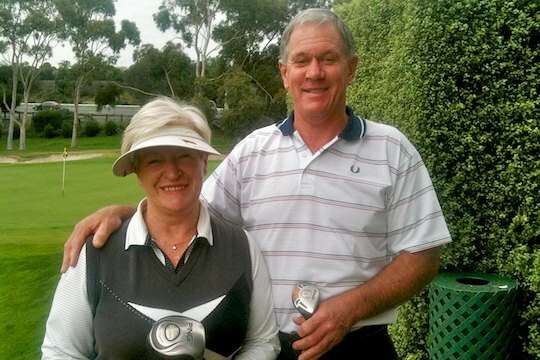 Two members of Melbourne’s Kew Golf Club achieved what could be a golfing world-first recently. Dorothy Chard and her husband, Ian, both had holes-in-one on the same hole on the same day. Dorothy, a 24-marker, was playing in the Thursday women’s weekly morning competition when she aced the 146-metre par-three 14th with a driver. Seventeen-handicapper, Ian, joined the men’s field on the back nine in the afternoon with the knowledge that his wife had already aced the 14th and replicated Dorothy’s feat from 169 metres. Several minutes elapsed before Dorothy had realised her achievement. “I said to them, ‘it’s probably gone over the back’,” Dorothy said. “We walked up to the green and I took my two clubs across to the back of the green, couldn’t find the ball, so I went back down, had a look in the hole and there it was. When Dorothy finished she was surprised to see Ian warming up on the putting green because he had facial surgery earlier that morning. Ian also missed out on seeing his ace find the bottom of the cup. “The guys said it was a good shot and some people on the 15th were fortunate enough to see it go in the hole,” Ian said. Neither player had scored an ace previously and Ian was quick to inform his wife after his perfect shot. “After I’d had a few drinks with my friends and I was leaving the club he called me and said ‘I’ve just had a hole-in-one on the same hole’,” Dorothy said. Ian watered down his hole-in-one and said it was a lesser achievement than Dorothy’s. “Her hole-in-one counted,” he said. The married couple’s astonishing tale came less than 13 months after a similarly rare result at Kew Golf Club. Chris Dunn, a past club champion at Kew and pennant player, had two holes-in-one in the same round on the same day in April last year. TALENTED COUPLE: Dorothy Chard and husband, Ian, all smiles after shooting holes-in-one on the same hole on the same day at Kew recently. Reversible course coming to Royal Queensland?